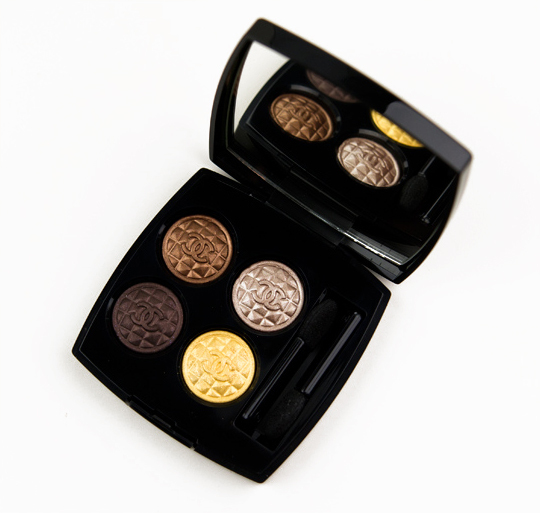 Chanel Topkapi Eyeshadow Quad ($65.00 for 0.14 oz.) is one of the highest quality eyeshadow palettes I’ve seen the brand put out in the time that I’ve been reviewing their products (about four years). There have been standout palettes released, but Topkapi is no gimmick–it delivers. These are smooth, buttery shades with absolutely zero powderiness that apply like silk and deliver rich color payoff in a single pass. 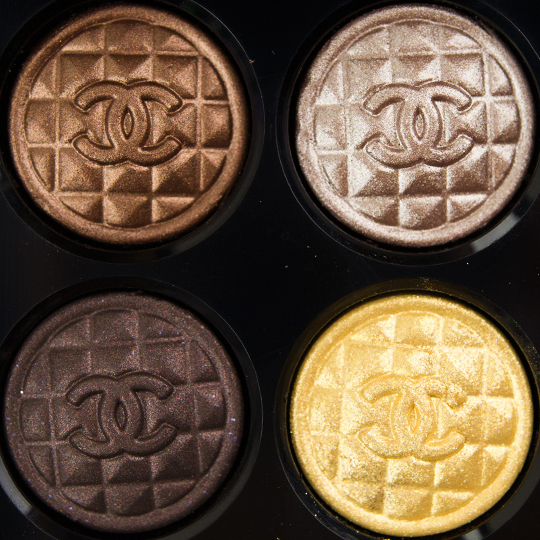 The texture is different from normal Chanel eyeshadow quads–much richer. 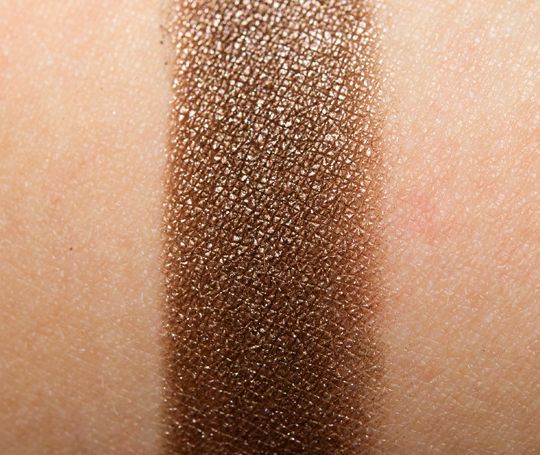 The quad contains a medium-dark brown with copper shimmer (think the tone of MAC Swiss Chocolate with the richness of NARS Galapagos); taupe-brown with a frosted finish (a better, more pigmented version of MAC Caviar Dreams, very similar to Inglot #402 and theBalm Insane Jane); deep-dark brown-black with a hint of burgundy (MAC Beauty Marked seems similar, but definitely more burgundy and a pain to work with); and a bright, metallic yellow gold (similar to Urban Decay Eldorado but better quality, also Inglot #403 and MUFE #10). As lovely as the colors are and how they coordinate with each other, the shades themselves are not particularly unique. Depending on what your personal stash looks like, it may or may not be worth the splurge. What impressed me most here was the texture of the eyeshadows themselves. The texture is soft without being powdery, smooth and rich in color, and all of these characteristics enable the shades to blend together effortlessly. I found the color palette here suited my skin tone quite well–so much so that for a few seconds, I had the urge to get a second one. If I wasn’t a beauty blogger, I could easily see this as being a go-to palette for me. 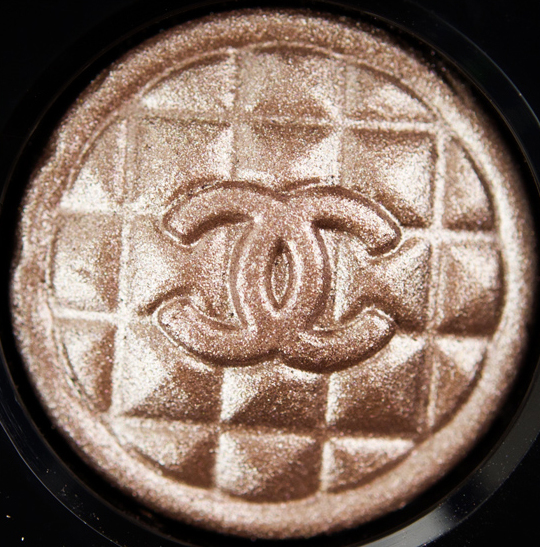 Great eyeshadows exists in a variety of textures, finishes, and shades; my personal favorites are more buttery–the smoothness of a cream eyeshadow but in powder form–like the kind found here (often found in brands like theBalm, Hourglass, Le Metier de Beaute, Urban Decay, and so on). I already got mine! My only issue was when I forgot to put on primer and the shadows melted away in the heat 🙁 But when I use UDPP, they lasted great. I am still debating getting a second one while they are still around! The gold here is so much easier to work with than Goldfinger! I like the color of Goldfinger but find the texture less impressive. Hey, did you buy it from a chanel store or chanel counter?? 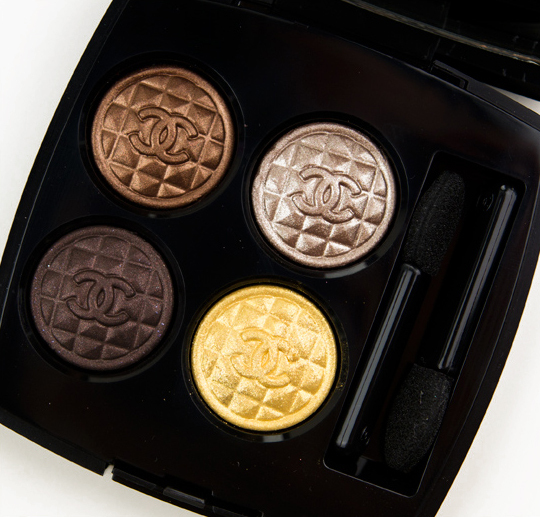 What a totaly lovely palette from Chanel! as beautifully gorgeous as they are, these all look SOOO dupable and are deffinetly not worth 65 bucks in my opinion…. I did mention in the review that they’re dupeable and provided possible dupes as well, but it’s going to depend on what you personally like, will wear, etc. If you don’t own any possible dupes, or maybe just one, it would cost you more to buy 4 full-sized eyeshadows (assuming mid to high end brands) than one palette 🙂 It’s all in what you think is worth it. I just ordered this, was afraid I would regret it if I didn’t. These warm shades suit me so I’ll be okay I think. I appreciate your honesty in the review! OMG I need this! When does it come out? saving up for this now. 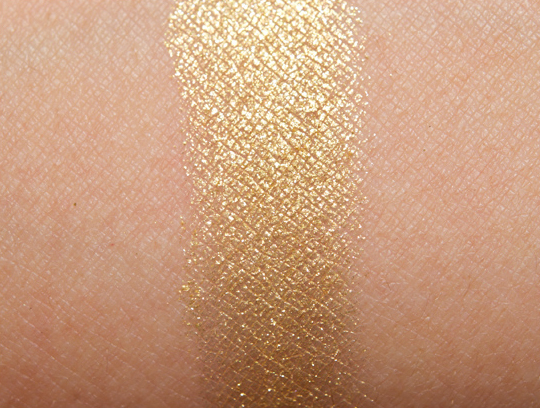 I don’t know… The pigmentation looks amazing but the colors of the shadows is something I can find anywhere! And for $65! Pff… I’ve given up on Chanel and switched to Bobbi Brown and I like it a lot more… I was always trying to convince myseld that I did love Chanel products when I really didn’t… It was the thought I was in love with! Oh crap, I was resisting so well until I saw you eye picture. Beautiful! What blush are you wearing? 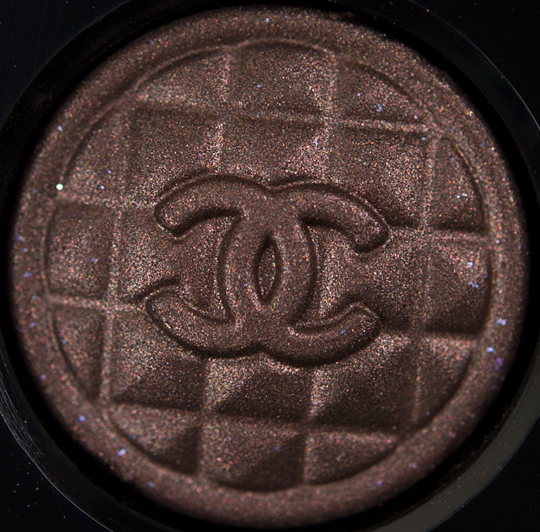 Although I find the colors absolutely gorgeous, I personaly wouldn’t pay that much money for something so shimmery, that you couldn’t wear on a daily basis. Of course, that’s just a personal thing. Anyway, you’re doing a great job with this blog, congrats! Awesome review as always Christine! I was about to buy this quad but then I thought about all the similar colors that I have in my stash :S ….I’m still thinking on getting it because of the texture… Do you think it might be similar color wise to the Dior Five Golds palette? or the Urban Decay Naked palette? Not really like either, IMO! Will it be sold internationally? Thanks for the review Christine, it looks nice on you! I know distribution is really limited – for U.S. I believe it is boutiques, very, very select counters, and online (for most of us, that’s where we’ll be able to get it). I couldn’t really get more info about locations from Chanel unfortunately! Gorgeous presentation and truly beautiful colours (I don’t usually like yellowy gold shades but this one is so beautiful) but considering the quad would probably cost close to $80 here in Canada, I think I’ll wait til we go States-side and buy it there for a lower cost, if it is still available. Ohhhh I want this!!!! I don’t have many browns and this pallette is TO DIE FOR!!! Not unique but the colors are great, and the look you created just looks beautiful!! !I may have to splurge on this one!!!! i already bought prelude so i’m not sure if i will pick this up…but it’s SOO PRETTY! I saw the quad before but i did not realize its name is Topkapı, a palace in Istanbul, Turkey. And i love the colors, looking forward to try it. Oh no! 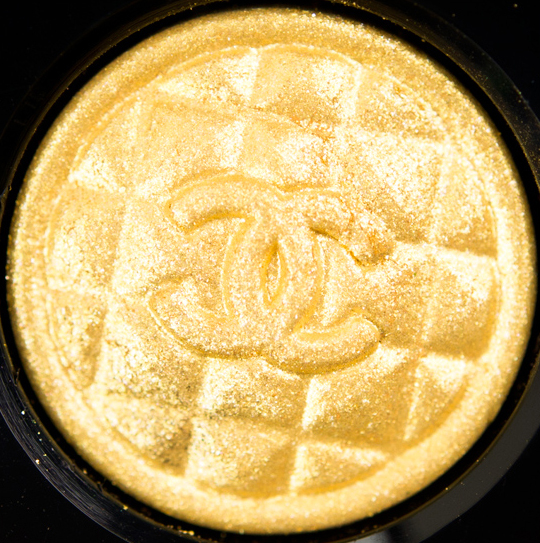 An A+, and I first decided not to get this.. tried to convince myself that I didn’t like the gold eyeshadow. Seeing you wearing the quad, it looks perfect!!! The gold is really interesting in the sense that it’s VERY metallic – you can see how it practically blinds the camera, haha. The quad is totally dupeable, it just depends on what you have (or don’t have)! Holy cow. Before I read the review, I glanced at the main picture and was like, “Wow, they’re GLOWING.” I’m not in the financial state to buy making a purchase like this one, but man, do I ever want to. Those colours are right up my alley! I just got this the other day ! Wow, look at those purple sparkles in the dark brown single photo! Christine, your photos often sell makeup better than the editorials do. I like your top in the FOTD pic, too! Ditto…Christine, your photos (and reviews for that matter) are absolutely phenomenal and have totally sold me on many different products, haha. And even though I’m super-pale/cool-tone, your reviews have never steered me wrong and I’ve always been able to pick out colors. I wasn’t sure about this palette before because I do have some similar colors, but now I am sold. Thank you so much for all of your hard work and for purchasing all of these different things to be able to give us reviews. You are the best!!!! This looks so beautiful, but there’s no way I can allow myself to pay $65 for ordinary colors. I am going to check out the substitutes you mentioned. Thanks for swatching these, Christine! What blush are you wearing here? I’m trying to keep my resolve to not get it, because of the dupeable shades/smaller size/higher price. But I’ll probably cave if it’s still available next time there’s a free ship code lol. so glad you did a look with this palette! love! Oh I am so tempted to buy this just for the name since I live in Istanbul. Plus the colors are gorgeous. Love the look of this, my bank balance is getting very worried about this Chanel Fall collection! So pretty..just bought this a couple days ago. Can’t wait to get it in the mail! Christine, what blush and lipgloss are you wearing? You look really good! Your review is the icing on the cake. After all the fabulous reviews on this quad, I don’t think I can resist any longer. I’m placing my order now and don’t think I will regret it. I’ve seen this on several blogs recently, but this is the first one that’s made me want it. The gold and the darkest color in particular are so gorgeous. Oh my goodness.. I don’t think I’ve ever seen such a complexity in the shadows and formula. This is definitely up my alley, however, I don’t see myself paying for that price tag! Thank you Christine!!!!! I’ve been debating the purchase of this quad for over a week, no kidding! Will you be reviewing the lipstick from this collection as well? Your eyes look amazing in this. I would vote for this to be a standard look for you to reach for lots of the time. 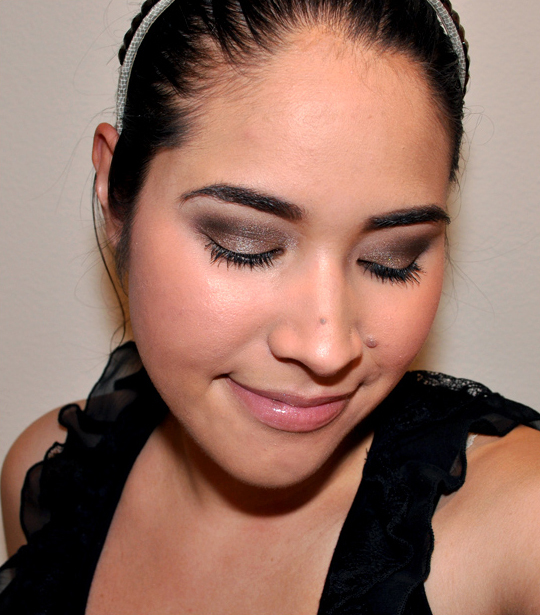 It’s got a lot of colors, but blended together they look like one great smokey eye that is very complimentary. I have this and it really is beautiful! I too was disappointed in the size of the shadows for the weight too! I had to return my first quad because a shadow wasn’t glued down when I received it. I’ve had a shadow come loose in the second palette too. Handle with care! Aw man. This means that it will be over $100 in Australia, if available at all. I REALLY gotta have it. ….and the search begins. Thanks for a great review and for all your other great reviews. You rock!!! 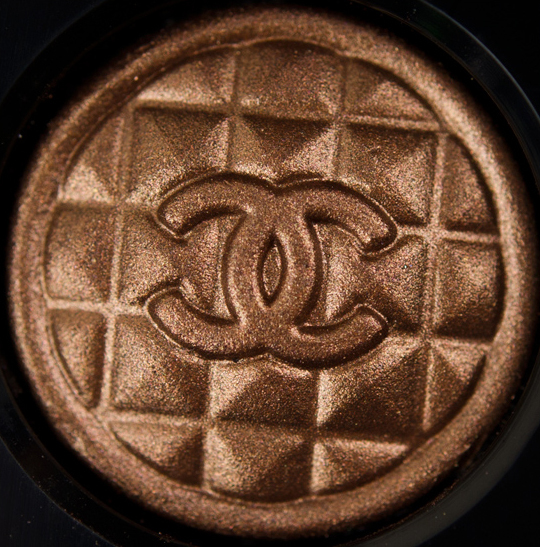 Chanel cosmetics will always hold a special place in my heart since I bought some of the collection when it first arrived in the U.S. and I was a teenager then….but for some reason, Chanel does not hold my interest. Possibly because the amount is so skimpy in the container…or that those colors look similar to the ones found in the Urban Decay Naked Palette. CHRISTINE! Why would you post such a gorgeous quad that from all the pictures will look fantastic on me (since I have the same undertone & hair color as you) but is so expensive? I feel like I’m cheating myself if I don’t get this! Awesome pigmentation…and such lovely shades!! this is so worth splurging on! now i need to find out if the Asian markets carry it as i’m not from the US/Canada. I bought mine a few weeks ago, it is such great quality. The design is beautiful, it was hard for me to use it lol! I already have the Naked palette but this looks gorgeous and I know I can get a lot of wear out of these shades. Chanel is going to make me go broke with their new collections! Love it! Im Turkish and I really like the colour choices!!! 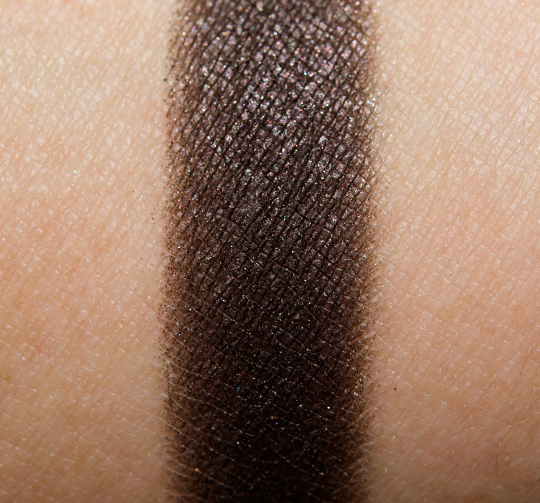 That deep-dark brown is a dream come true, but I don’t know if is worth to buy the entire quad only for one shadow! great review, thx. but i just cant find when is the release date in europe/Holland!? I don’t get info for Europe, sorry! adore, love this colors!!! and the look you crated ahhhh, to die for!!! I love this palette and ordered it already!I know that you don’t do tutorials but the look that you have is gorgeous!can you please tell how did you do it?THanks! Im debating If I just purchase this its such an ordeal…its like a box of decadent chocolates. To resist or not to resist that is the question. I hate how they are so dupable but the presentation is like wow! i ordered this just because of its name 🙂 also colors and the patterns on the shadows reminds me Ottoman Style.. 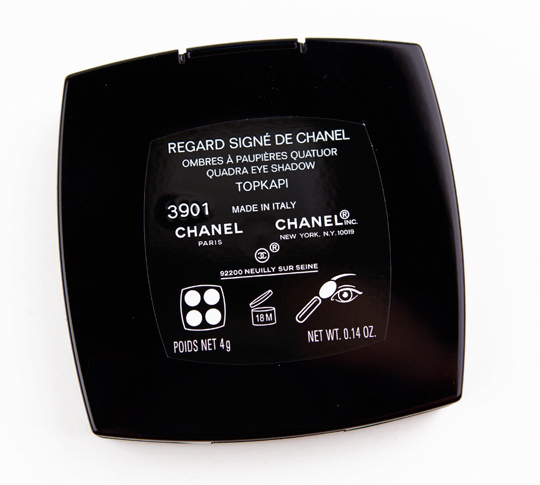 I want to buy this so badly but when I went to Chanel’s website, it appears to be sold out!! Does anyone know for sure if this is sold out or not? for how long are these going to be around?? I believe this is already sold out. why is it .14 oz? are us version quads always 0.14 and uk versions are 0,24 or ıs it like that only for topkapi? Hi. Would you please comment on how Topkapi would work for a 52-yo woman with very light skin and dirty blonde hair? I would say I have blue tones. I usually don’t wear heavy eye makeup on a daily basis and think this is a gorgeous combination or colors. I appreciate any thoughts you might have. I just discovered your site and find it fascinating! I’m a new reader of your blog and just saw this post. 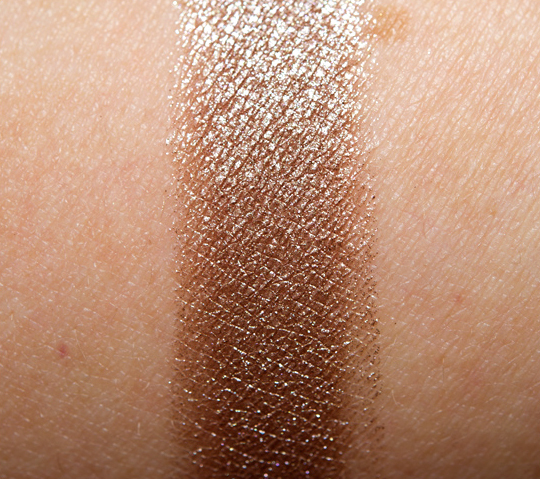 I’m in love with the darkest shade and am looking for a dupe since the palette is soldout… any suggestion ?? Chanel, PLEASE bring this back!